Both the Government of the Hong Kong Special Administrative Region (HK Government) and Shenzhen Municipal People's Government (SZ Government) have long recognized the need to enhance cross-boundary transport infrastructures for long-term economic growth and further regional co-operation. 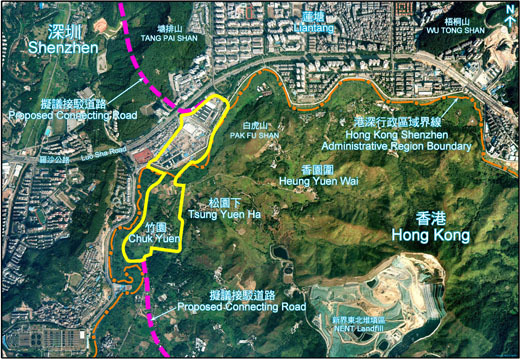 A joint study was commissioned in December 2006 to explore the need, function and benefits of a new boundary control point (BCP) at Liantang/Heung Yuen Wai (LT/HYW). 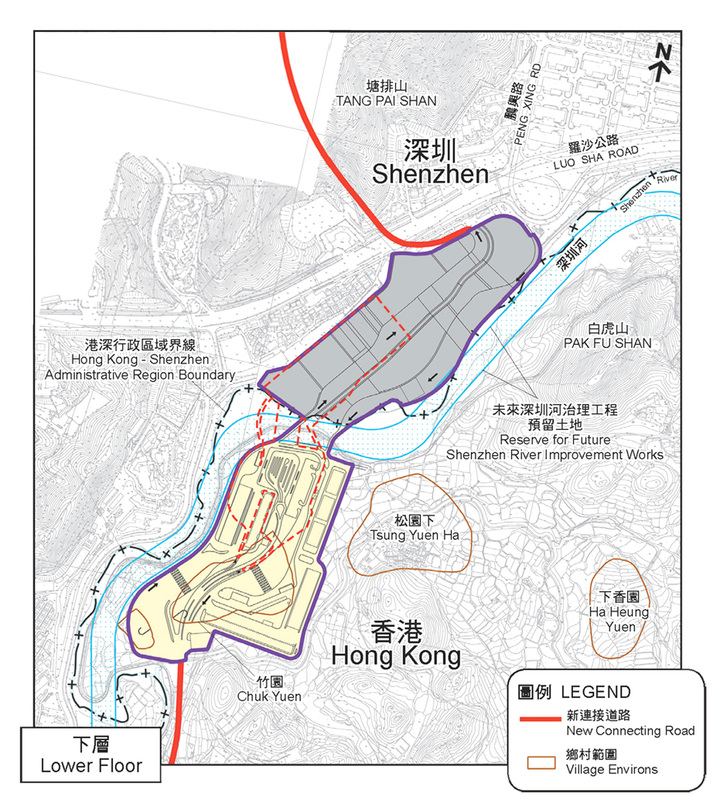 The Planning Department also commissioned a study in January 2007 to examine the planning, traffic, environmental and engineering issues of the new crossing, including land requirements and associated connecting road within HK. Both studies were completed in June 2008 and confirmed the need for a new BCP at LT/HYW. In September 2008, the two Governments decided to implement the new BCP, which is expected to be operational in 2018. 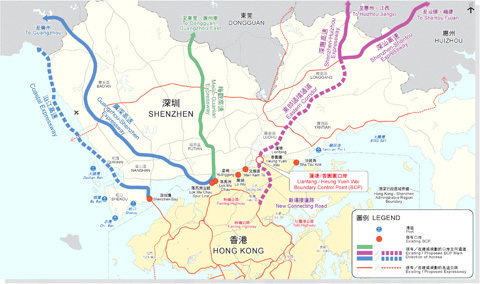 The new BCP will connect with the 'Eastern Corridor' in SZ, an expressway which links up the eastern part of Guangdong (GD) (including Shantou, Shanwei, Chaozhou, Jieyang etc.) and adjacent Provinces like Fujian and Jiangxi, via the Shenzhen-Huizhou and Shenzhen-Shantou Expressways. It will significantly reduce traveling time between HK and SZ and GD East, facilitate future development in these areas and extend the economic hinterland of HK and SZ. Strengthening the linkage with SZ and GD East is of strategic importance in terms of regional integration and co-operation. Cross-boundary traffic is anticipated to have continuous growth in line with our closer ties with the Mainland, in particular, with being GD East identified as one of the receiving areas for the relocation of traditional manufacturing industries. Improvement to the existing BCPs (Man Kam To (MKT) and Sha Tau Kok) in the New Territories East (NTE) is constrained by their physical locations and capacity of the connecting roads. The new BCP will help re-distribute cross-boundary traffic in NTE and alleviate the frequent congestion at MKT BCP, resulting in enhancement of the overall operational efficiency, handling capacity and quality of service for BCPs in NTE. 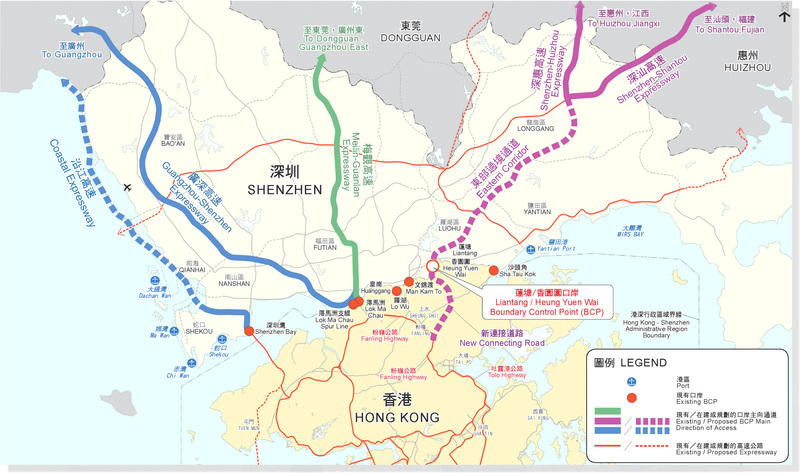 By diverting cross-boundary traffic currently concentrated on the western part of HK, the new BCP would enable a more balanced distribution of cross-boundary connection with the Mainland network. This would help achieving our long-term target of commuting to major cities in GD within a half-day and other major cities adjoining GD within one day. 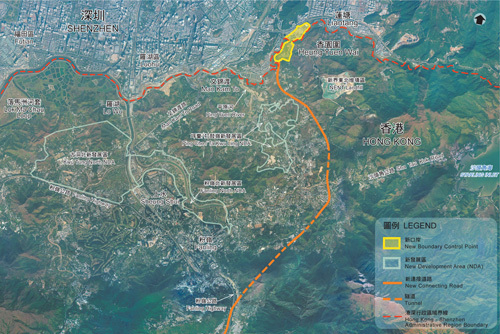 The new connecting road linking up the new BCP with Tolo Highway via Fanling Highway will improve and enhance the overall transport network in NTE and provide a convenient access to the proposed Ping Che/Ta Kwu Ling New Development Area. The new BCP will serve cross-boundary goods vehicles and passengers traveling between HK and SZ East, Huizhou, GD East, Jiangxi and Fujian. Goods vehicles delivering fresh produce, livestock and poultry would continue to use MKT BCP. It is estimated that in 2030, the new BCP will have about 20,600 vehicular trips and 30,700 passenger trips per day. Customs, immigration and quarantine facilities of HK and SZ will be located within their respective territory. An integrated passenger hall building over the SZ River will provide the greatest convenience for travelers. 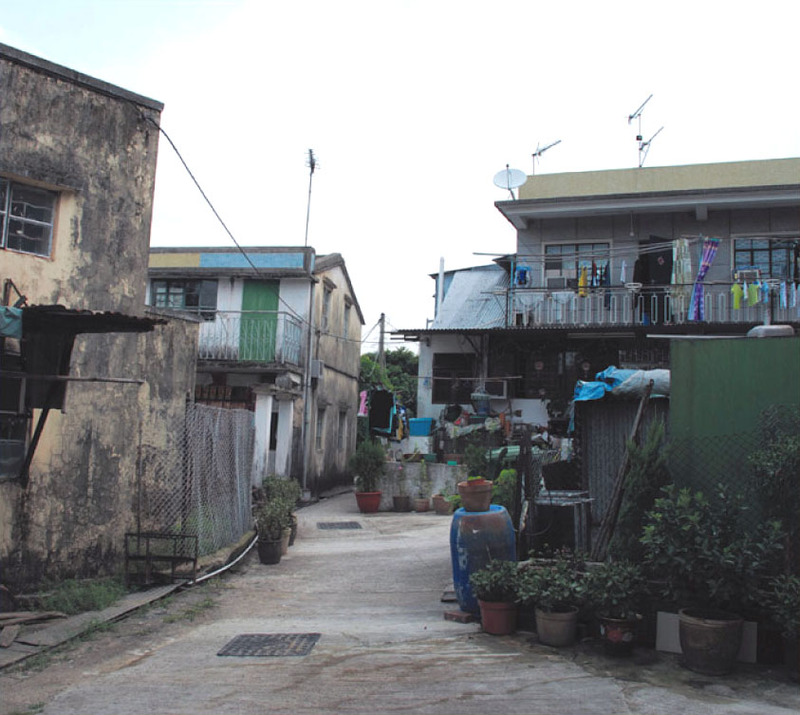 A two-storey design is adopted to minimize land requirement. 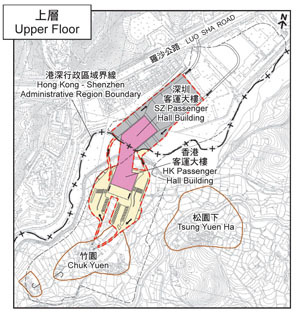 Facilities for goods vehicles and public transport interchange are on the ground floor (about 18.3 hectares on HK side). 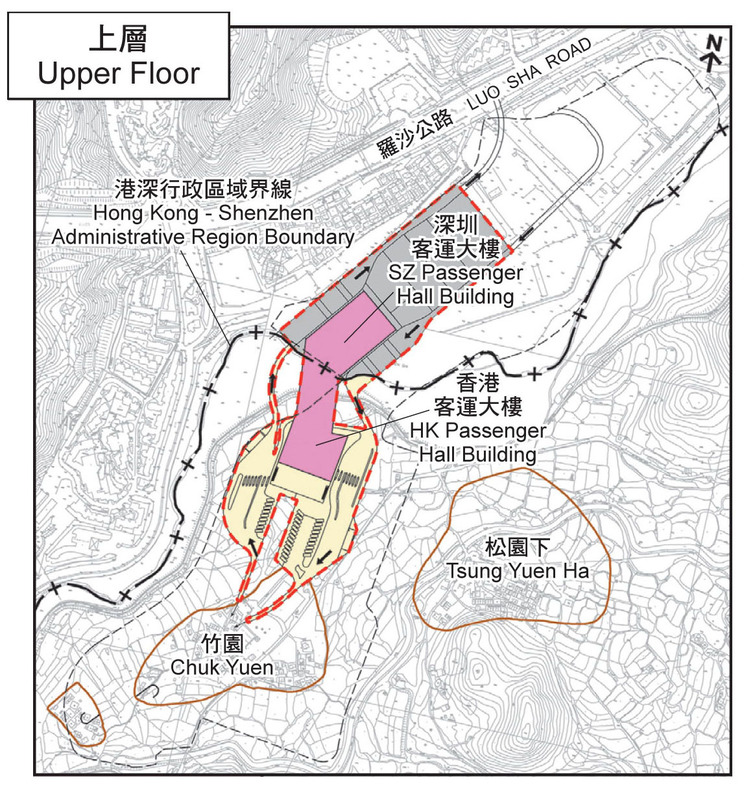 The upper floor, which is about one-fourth of the size of the ground level (about 4.6 hectares on HK side), will serve passengers, private cars and coaches. Balance the need for development and ensuring ecological and environmental protection. 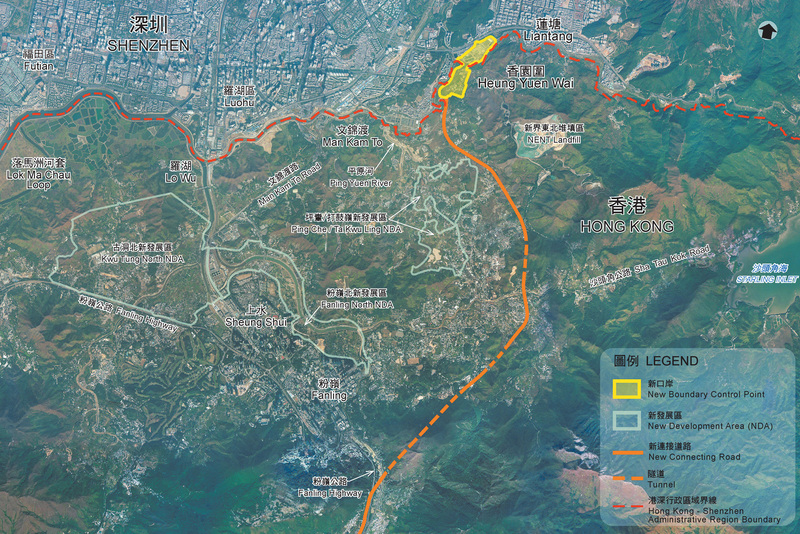 The final design is subject to further study of HK and SZ Governments. A new dual 2-lane truck road linking up the new BCP with the Tolo Highway via Fanling Highway is recommended. Its length is about 10 km, comprising 3 sections of tunnel (total length about 3.5 km) and viaduct (about 6.5 km). The final alignment of the road is subject to further study. 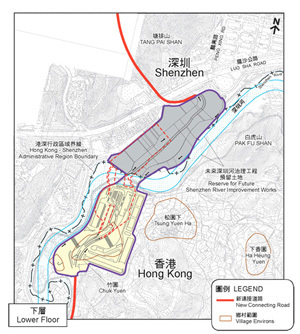 The improvement of a section of the SZ River (about 4 km) starting from its confluence with Ping Yuen River to the eastern boundary of the new BCP will be implemented as part of the new BCP project, based on the detailed design and implementation programme to be agreed with the SZ Government. 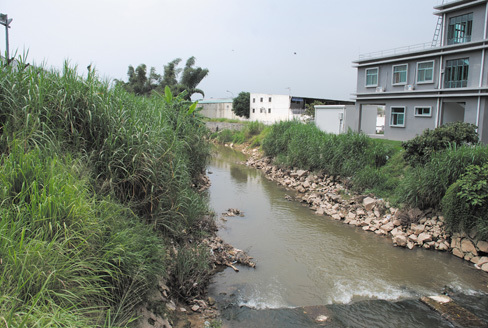 The implementation of the new BCP, the new connecting road and the SZ River improvement works will require the resumption of some private land including those in the Chuk Yuen Village. Relocation of the village is required. 下載 Adobe Acrobat Reader 以開啟及列印PDF格式.